14 fun-filled tracks that will excite children and adults alike about the glorious gospel of Jesus! "The riches of the Gospel are immeasurable. We get to be in God’s family! We are transformed from within! Our sins are forgiven, our wounds are made beautiful, and our joy never ends. 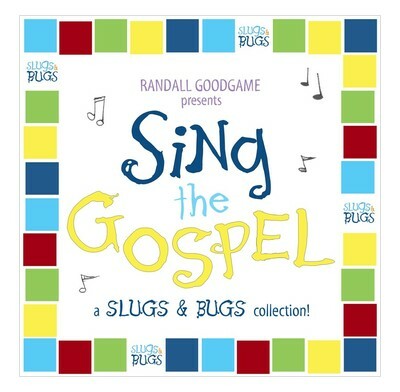 Last year, our friends at The Good Book Company in the U.K. requested that we curate a collection of the Slugs & Bugs songs that explore these different aspects of the Gospel, and the result became 'Sing the Gospel' - a Slugs and Bugs collection." "For Sing the Gospel, we chose Gospel-minded songs from the first three Slugs & Bugs CDs plus a splash of silliness for good measure, added three new Scripture songs, and Home in Heaven, (inspired by Revelation 21) written for the 2015 Revive Conference in Canterbury, England. To close the CD, we adjusted THE LORD’S PRAYER song from SING THE BIBLE VOLUME 1 to reflect the traditional Book of Common Prayer." Nice upbeat tunes which are biblically accurate - recommend for babies, kids & adults alike! Our family love slugs and bugs. We have bought this for Christmas but I have heard it and think it's my favourite slugs and bugs cd. It's so great for learning scripture!